Picture owning your own idyllic beachfront home, with waves crashing on your beach and only steps from the Four Seasons Hualalai Resort. This extraordinaire $15.75 million beachfront home is that dream fulfilled. Situated in Hualalai Resort, the Big Island’s most desirable resort area containing 40 miles of pristine oceanfront shoreline along the Gold Coast of the Big Island. Unbelievable close proximity to world-class Four Seasons Hualalai Resort with its world renown amenities, including 2 Golf Courses, Sports and Beach Clubs. Prime location in unbelievable proximity to five-star amenities of the famed Four Seasons Hualalai Resort. The exclusive community also enjoys an outstanding range of amenities ranging from the Hualalai Spa, Gym to the Sports Club to the Jack Nicklaus signature golf course. Direct access to the beach, where owners and their guests can conveniently walk to the fine sand shoreline and blue ocean from the lanai and enjoy the commanding views. Crashing waves and crystal-clear water beckons straight from windows throughout the home, including the master’s bedroom. A quick drive from the Kona International Airport and the City of Kailua-Kona. Top-notch features, expertly designed ceiling, kitchen and outdoor appliances as well as its own private pool and spa. The property comes furnished with life’s little to grand luxuries, including golf carts. Tropical Flora- surrounds the residence, tall trees and manicured landscapes with stretches of paved pathways offering a vast garden impression for its owners and guests. Modern comforts and nature marry well in this Hawaiian paradise, where one will find mildly sloping topography climbing from sea level to 225 feet in elevation. Tranquility is in adequate supply in this area showcasing three beaches (Kua Bay, Makalawena, and Four Seasons Beach) and privileged with ocean, sunset, mountain, and every landscape view imaginable. Hualalai residents and their guests, too, are in for a mélange of amenities, such as a sports club, cultural center, tennis club, canoe paddling service, and marine life programs. The distinct gastronomic fare in each of the four restaurants around could punctuate a day of calm or adventure. 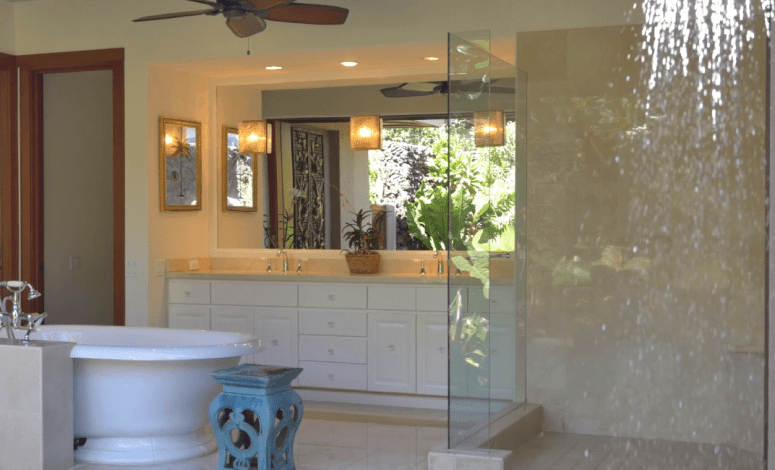 This upscale residence for sale, situated in the North Kona district, is a private offering that prospective Big Island homeowners shouldn’t miss out on. Harold Clarke, distinguished from other luxury real estate brokers in his emphasis on catering to both buyers and sellers, harps on the singular appeal of the Big Island to those looking to relocate or purchase a U.S. home. A major attraction for them: excellent infrastructure to fly in and out with ease. As a vacation home, Harold Clarke adds, a Big Island property could be a fabulous idea for families and their guests whether they have a short weekend or two weeks or a month to spare for pure fun and relaxation, not to mention the detoxification it offers from the mainland.